We’re not going to let summer say au revoir without spreading a little municipal love. 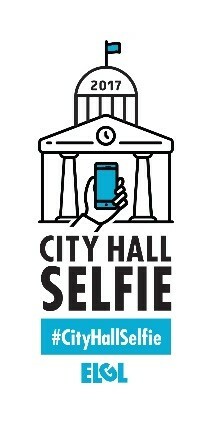 This year, MML will celebrate the important work happening at the local level by joining elected officials around the globe by participating in #CityHallSelfie day, August 15. And we can’t do it without you. Help us get the award for State with the Most #CityHallSelfie. Last year’s winner, California, did it with only 50 selfies. We know Maryland can top that, plus some! 2)	Use the hashtags #CityHallSelfie #Maryland to show your civic and Maryland pride! We don’t want to have all the fun. Check out the 21 categories below and get the whole town involved. The 2018 MML conference planning committee (CPC) will begin developing next year’s summer conference agenda in early September and would appreciate educational session proposals from MML membership and departments, state agencies, conference exhibitors, strategic partners, and other subject matter experts. Proposals should include a 50-100 word abstract describing your session, as well as 2-4 learning objectives and names of suggested instructor/presenters if available. You are encouraged to submit your proposal using the summer conference proposal form prior to September 1, 2017. If you have questions or need assistance, contact MML Education Services Director Tom Reynolds at 410-295-9100 or tomr@mdmunicipal.org. MML is excited to announce that the fall conference will return to Montgomery County in October, 2017. This year’s conference will be held in hip and historic Rockville at the newly renovated Hilton Washington DC/Rockville Hotel. During the conference, municipal officials will have the opportunity to attend workshops, exchange information, and renew acquaintances. At Friday afternoon’s annual business meeting, the membership will discuss and adopt the League’s legislative agenda, as recommended by the MML Legislative Committee. This year, attendees will have the opportunity to attend thirteen different workshops, forums, and discussion sessions, including three Academy core classes, and several elective classes. The Academy core classes at this year’s conference are Public Information Act, Structure of Municipal Government, and Consensus and Team Building. Academy elective workshops will address a variety of issues, all of which are relevant regardless whether you represent a large city or a small town. Topics under consideration include: Medical cannabis/opioid issues, grassroots strategy and lobbying; participatory budgeting, emerging trends in municipal government, economic development strategies for attracting the right retail mix, and a session exploring affordable housing and rent stabilization issues. The fall conference also provides opportunities for several other groups to meet. The MML Board of Directors, District Vice Presidents and Chapter Presidents, and the Maryland Mayors Association will gather on Thursday, October 12. The MML Legislative/Resolutions Committee will also meet on Thursday, October 12. Registration information will be included in the July/August issue of Municipal Maryland magazine and online registration will open soon. Thanks to everyone who completed MML's 2017 summer conference evaluation form. Participants who completed the evaluation form were eligible to win hotel stays in Ocean City. And, thanks to the above hotels for donating overnight stays to the above MML summer conference attendees. The Maryland Attorney General’s office recently published a set of training guidelines for public officials subject to the Open Meetings Act (OMA). These guidelines provide good background on the training requirements, including new provisions that passed the General Assembly earlier this year. However, they do not replace the formal workshops needed to comply with the training mandates. •	The Academy for Excellence in Local Governance (Academy) will offer a special stand-alone opportunity to take the OMA core class on September 12, 2017 in the City of Gaithersburg. This class will satisfy requirements for both Academy certification and the OMA training requirements. You will find complete details regarding time, location, and course registration here. •	MACo’s 2017 Summer Conference in Ocean City, August 16-19. The OMA core class will take place on Wednesday, August 16, and municipal officials are eligible for a 50% discount off the regular one-day registration fee. See details here. •	Online Open Meetings Act training through the Institute for Governmental Service and Research’s Virtual Learning Center. Note, however, that while this online training satisfies the certification requirements of the OMA, completion does NOT satisfy Academy core class requirements. For more information on these training opportunities, contact MML Education Services Director Tom Reynolds at tomr@mdmunicipal.org or 410-295-9100. For additional information on the new requirements related to the OMA, see the League’s 2017 Final Legislative Report. U.S. Communities recently announced that a new contract for playground equipment, outdoor fitness equipment, site accessories, surfacing and related products and services was awarded to GameTime and KOMPAN. This contract was awarded through a competitive solicitation process conducted by lead public agency, City of Charlotte, North Carolina. The contract term is for five years with a start date of July 1, 2017, with the option to extend the contract for two additional periods of two years each. For more information, visit U.S. Communities’ Parks & Recreation Solutions page. Classified advertisements from Maryland cities, towns, counties, and government agencies will be published in MML’s e-Bulletin at no charge. If you would like to advertise an employment opportunity, a request for proposals, or a piece of equipment for sale within the State of Maryland, please e-mail the ad copy, in a text only word doc, 200 words or less to classified. Ads will appear for a 90-day period and can be resubmitted for posting if needed. To unsubscribe: E-mail unsubscribe with your name and the word unsubscribe in the Subject line. Proposals should include a 50-100 word abstract describing your session, as well as 2-4 learning objectives and names of suggested instructor/presenters if available. For maximum consideration by the CPC, proposals should be submitted to MML Education Services Director Tom Reynolds at tomr@mdmunicipal.org [mailto:tomr@mdmunicipal.org] prior to September 1, 2017. The Maryland Attorney General’s office recently published a set of training guidelines for public officials subject to the Open Meetings Act ( OMA [http://www.marylandattorneygeneral.gov/Pages/OpenGov/OpenMeetings/training.aspx] ). These guidelines provide good background on the training requirements, including new provisions that passed the General Assembly earlier this year. However, they do not replace the formal workshops needed to comply with the training mandates. •	The Academy for Excellence in Local Governance (Academy) will offer a special stand-alone opportunity to take the OMA core class on September 12, 2017 in the City of Gaithersburg. This class will satisfy requirements for both Academy certification and the OMA training requirements. You will find complete details regarding time, location, and course registration here [http://md-municipalleague.civicplus.com/DocumentCenter/View/3160] . •	MACo’s 2017 Summer Conference in Ocean City, August 16-19. The OMA core class will take place on Wednesday, August 16, and municipal officials are eligible for a 50% discount off the regular one-day registration fee. See details here [http://www.mdcounties.org/SC17AcademyCoreDiscount] . •	Online Open Meetings Act training through the Institute for Governmental Service and Research’s Virtual Learning Center [http://www.igsr.umd.edu/VLC/OMA/class_oma_intro1.php] . Note, however, that while this online training satisfies the certification requirements of the OMA, completion does NOT satisfy Academy core class requirements. For more information on these training opportunities, contact MML Education Services Director Tom Reynolds at tomr@mdmunicipal.org [mailto:tomr@mdmunicipal.org] or 410-295-9100. For additional information on the new requirements related to the OMA, see the League’s 2017 Final Legislative Report [http://www.mdmunicipal.org/DocumentCenter/View/3100] . Classified advertisements from Maryland cities, towns, counties, and government agencies will be published in MML’s e-Bulletin at no charge. If you would like to advertise an employment opportunity, a request for proposals, or a piece of equipment for sale within the State of Maryland, please e-mail the ad copy, in a text only word doc, 200 words or less to classified [mailto:mml@mdmunicipal.org] . Ads will appear for a 90-day period and can be resubmitted for posting if needed. To unsubscribe: E-mail unsubscribe [mailto:mml@mdmunicipal.org] with your name and the word unsubscribe in the Subject line.